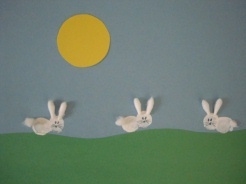 Have the kids create their own Bunny Collage, made out of simple craft materials and things you have around the house! 1. Cut out a green strip of "grass" and glue it onto a piece of sky blue paper. 2. Pour some white paint into a shallow container or paper plate. Make your Bunnies out of two thumb prints. One for the head, and one for the body. Make as many bunnies as you'd like, anywhere in the meadow. 3. Break off the ends of your Q Tips and glue them on top of your thumb prints to make the bunny's ears. Glue on a small wad of cotton ball for the tail. 4. Cut out a sun from yellow construction paper and glue in on your scene. When the paint is dry, draw on the eyes, nose and whiskers. Other options to add to your collage are green pieces of tissue paper stuck on as grass, or cotton ball clouds, be creative! You can always just use one thumb print as well, which may work better for the little ones.